Here is the heat vent to the kitchen. Which the previous owners (BOOZIE??) covered with cabinets. How about a nice home cooked meal? Even though we succeeded in destroying the kitchen ourselves last weekend, we are a little worried about how the drywall will go on. All the windows and doors stick out from the studs by 7/8" so I have no idea how that is going to work. Drywall Tom is coming tomorrow, electrician Terry is working daily, and HVAC Andy is going to try to figure out how to vent my fabulous range hood out with double joists, conduit and filler wood crowding the available space between the floor joists....it just never ends! Even though I haven't picked my exact slabs of granite yet, I have purchased my faucet, and it is gorgeous! I was so excited to see this baby in the mail today. This faucet has a 'new' model out now, so you can get the 'old' one for under $100! YES, I got his fabulous faucet for $85 from Plumbersurplus.com. Rush over there and get it before they are gone...it is a solid, heavy, brass faucet with ceramic discs, not plastic. Love it. WOW!!!! it is all worth it, sara... all worth it. Congrats on the little baby! How exciting! I'm so excited to see your kitchen progress. We've got ours slated to go in the next year, and it's a similar situation to yours. Old, crazy previous home owners, etc. Right now, we've got custom built in cabinetry from approx. the 1950s. The door openings are so small I cant even get mixing bowls in them! Drop ceiling over old plaster, linoleum over other linoleum, maybe wood under there? Anyway, I hope that you'll do a big recap at the end of your project. I'm dying to see a realistic cost breakout for someone who does it like we do - some DIY (demo, etc), but hiring people for the good stuff. Best wishes. Your choices are beautiful so far! Umm.... that faucet is amazing. I can't wait to see the next phase of your kitchen remodel! How exciting!! 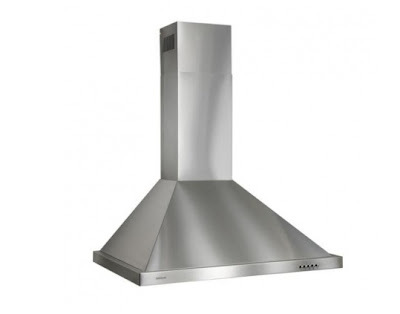 Where'd you get the range hood from (or what brand is it?) It's gorgeous! As is the faucet! WOW! It always gets really bad before it gets better, but you know that. Great deal on that faucet! Okay, we've got to be better about visiting each other! I knew about the kitchen (holy cow I feel for ya!) but totally missed the Pregnancy Post. How could that happen, I usually read my bloggers list daily!! Oh well, Congratulations Sara!! Very happy for you. Looking forward to kitchen and preggers posts there girl! Elizabeth, the range hood is a Broan 30" (B5830SS) from Lowes. whoa is right, that's a lot of progress. Are you rerouting the heating vent? Lisa - yep, the heating vent will be shortened to a 'toe kick' vent under the lower cabinet there. We may also add another vent to the baseboard on the window wall. We are also adding insulation to all walls, so we're excited about that! I saw the photo before I saw the tile and my first reaction was definitely Whoa!! Tons of progress happening over there! I want to see the afters immediately. Is it possible for me to be more excited than you? Oh my, I feel your pain! We are just back to a fully functioning kitchen and it feels fab, just keep your eye on the prize!!! For the door/drywall gap, you can put 3/8" wood strips behind the trim on the drywall side. You can make them with a table saw or maybe you'll get lucky and find a hardware store has them premade for just such an emergency. Just bought that faucet, thanks for the heads-up. It's pretty. My jaw is hitting the floor about the price of that faucet. Amazing! What a deal! Everything is going to look so great!!! Whoa for Reno...wow for the AWESOME faucet deal!! high five! That faucet is da bomb. You guys are so smart hiring that tough stuff out. I will never drywall again. Oh wow. You're right, "whoa" is pretty much the only word to describe all this! Also, I'm going to be totally jealous of your new range hood. Yummy faucet! I wish I could fit a range hood in my kitchen... Yours is going to look gorgeous! Seriously - you guys are my heroes! Your kitchen is going to be amazing - thank you for sharing all the steps to it. Gives me hope that I might one day be able to purchase a fixer-uper! My husband would just love you to pieces for choosing ceramic over plastic discs! Ha! Can't wait to see drywall start to come back up!